Homemade tap holder for an RF30 mill fabricated from CRS. 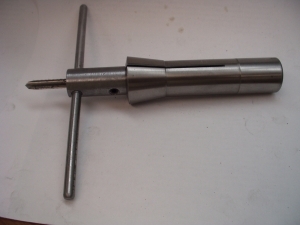 Axial hole is drilled to a depth equal to the tap shank length. Set screws secure the tap to the body. Handles are 1/4" diameter steel rods threaded to the body.